Wooaah, wait a minute, hold the phone, and just a cottin' pickin'... Mani has really done something different here! Some may remember the Privat CD reviewed last time. There, he took on every non-European musical motif he could get his hands on. This time he focuses on Balinese gamelan exclusively, in what is a real corker of a project. The last guy to try something as thorough as this was Eberhard Schoener, but this is a far cry from his Bali-Agúng. The story is vague as to how Mani and Peter pulled this off technically. A matter of syncing up their drums with pre-existing recordings in a studio environment, was my initial guess. 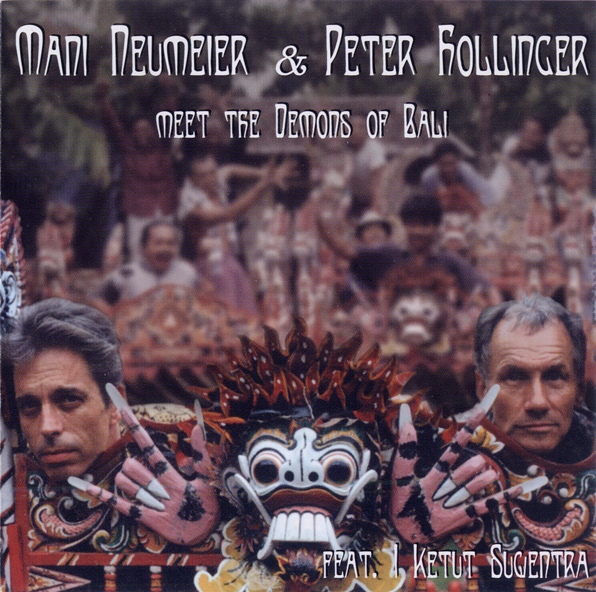 German liner notes however, suggest that the two hauled themselves off to Bali to record with various members of gamelan ensembles in a live situation. Not impossible, you may offer, but my knowledge of gamelan tells me that the configurations of unrelated ensembles that he has assembled (my ears hear Gong Gede, Anklung, Kebyar, Joged Bumbung, Beleganjur and others) would almost never occur in normal musical practice in Bali. The recording features twelve middle-length pieces in which superimposed patterns from two, sometimes three, of the aforementioned styles provide the undercurrent for Peter and Mani to weave their drumming in and around of. I do not know who is playing what, but they concentrate mostly on tom-toms, muted gongs, and bells; no cymbals. A commendable job has been done to assure textural and tempo variety throughout, but the listener must realize there is no harmony or melody in a Western sense. For those familiar with Balinese gamelan perhaps some of the mystery is given away. But for the unfamiliar a worthwhile endeavor indeed, and another feather in Neumeier's cap of eccentricity.